The Public Secret is by far the largest project undertaken by the collective to date. Quite literally: this disused warehouse is more expansive than many of the nearby major established galleries. The work that culminated in our last show ‘Will The Last Person to Leave The 20th Century Please Turn Out The Lights?’ was of a very different nature: it was largely an exorcism of the persistence of 20th century culture, through a reflection on events in 2017 that seemed to suggest an ending to what the blog Flip Chart Fairy Tales called ‘the long 1990’s’. If the sour-turning culture and ethos of the 1990’s still seemed to grip the first 2 decades of the 20th century, then it was merely a locatable iceberg tip for a prevailing sense that we were being dominated by spectres of the whole of Modern Western culture, which were encasing us in lives unfit for 21st century demands. The exhibition was dominated by hauntology, most notably through the spectral presence of Mere Pseud, whose memory reprisals could well still be chattering away in the disused space we used. It was, however, guided by the writings of the then-recently passed Mark Fisher, who, to paraphrase, said ‘we remain trapped in the 20th century, because it feels like the 21st century never occurred’. But with ongoing events in 2016 and 2017, the belief structures that arguably glued us to the 20th century seemed to be giving way. 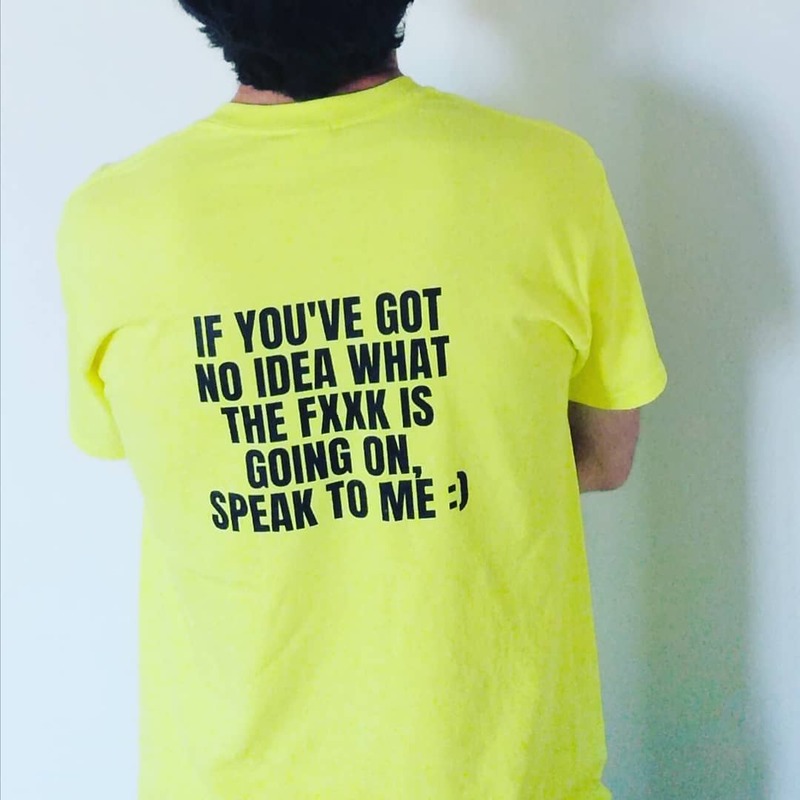 This show, in an abandoned pub in the unrealised landscape of West Yorkshire (where nothing – urban, suburban, rural, new or old – seems quite at ease) was apt to leave the ‘what next’ question blank. This was, after all, The Retro Bar at the End of the Universe; we felt so at home there, we could have quite easily sank into this self-made 20th century mausoleum and remained there forever. Since July 2017, the geopolitical landscape has become more grave; severe ecological disruption has clearly shown signs of coming home to roost, and the live exorcism of the toxicities hidden in Western Culture has intensified in movements such as the MeToo Campaign. However, one issue seemed to link all of these up; mental health. But we weren’t just talking about mental health from the perspective of the rise of depression and behavioural disorders in industrialised nations, we were beginning to suggest that the entire meshing of contemporary life from top to bottom may not only the product of an unfolding of historically based trauma; but the radically new injection of ‘always on’ communicative devices into pockets of people in an already advanced consumer capitalist culture, is seemingly dredging all traumas up to the surface at a pace our current institutions cannot reckon with. The Retro Bar at the End of the Universe somehow found its body and organs from a rabble of preoccupations, and blunt utopian tools, within accommodating, non-judgemental conversational space. As much as we are knee-deep in critical understanding of our present moment we are not at home in the arena of full-frontal critique. As much as we more or less agree that the current arrangement of social and political order is obsolete, we are never in unison over a singular remedy. Indeed, since the European Referendum here in the UK, I (John Ledger) as an acting member have felt internally split; not between the clumsy binaries of Remain and Leave, but in how to actively deconstructive the messy torn fabric of a contemporary place like the United Kingdom, with least possible pain. And so in June of this year, we embarked on The General Election of Governing Emotions (‘#GE18’). 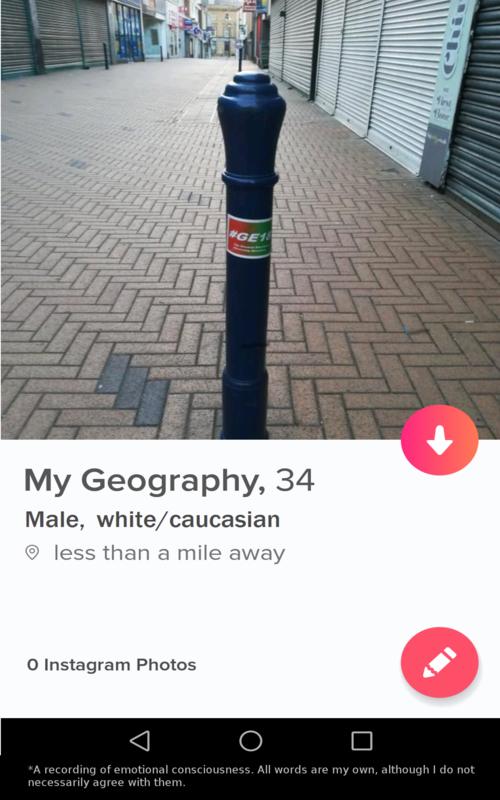 A ‘what if’ moment that tried to be somewhere between fictional and actual, #GE18 at its core was trying to circumvent the deep divisions fragmenting our shared experiences of the contemporary, in order to ask people how they would ideally like to feel and how they would like their society to feel. The chosen method of voting tried to take this beyond the realm of mere day dreams and place it in the environment of an actual voting station, which, for the majority of us, the only place we get to participate (even if tentatively) in democracy. The Public Secret, as a concept for a project, largely took its que from The Institute For Precarious Consciousness Raising’s article on the Plan C website. From here we understand the public secret to be “something that everyone knows, but nobody admits, or talks about”. And “as long as the dominant affect is a public secret, it remains effective, and strategies against it will not emerge”. And for as long as strategies do not emerge “public secrets are typically personalised”, meaning people feel personal shame and guilt for problems that they didn’t cause; big, external problems are internalized. In keeping with #GE18, it was important that our project aimed to involve others as much as possible. 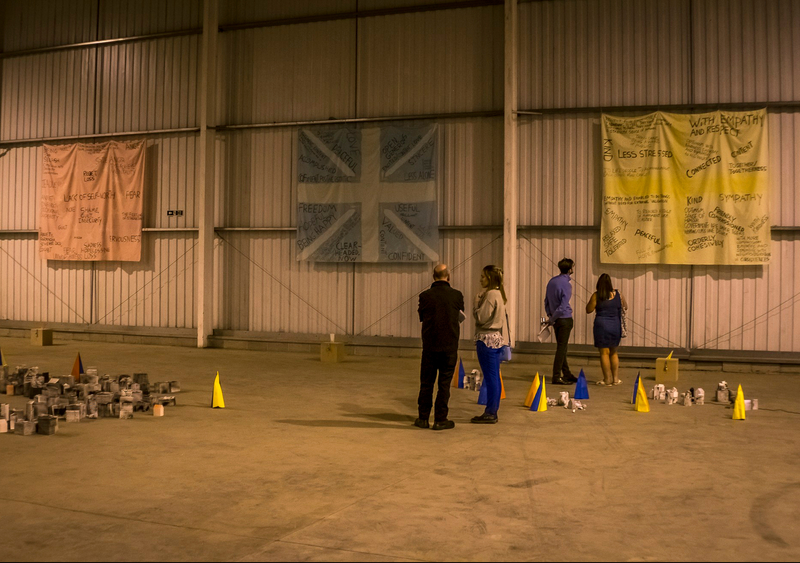 Shared doubt about whether anybody would attend an event 3 miles south-west of central Leeds in the unfashionable West Yorkshire hinterlands, would have to be countered by a wagering on unexpected outcomes for the project’s intent to survive. The distance, and the ways for engaging people were points of intense debate. Many of us work in galleries with much focus on family participation. So we already had ample experience and opinions on the difficulty of up-keeping a fine line between allowing people to participate in something meaningful and turning a space designed for critical thought into an extended playground (and, cuttingly, an extension of weekend retail therapy). How could we make a space that was both welcoming to all, but opens us to have discussions about politics and ethics in such a divisive and fraught period? 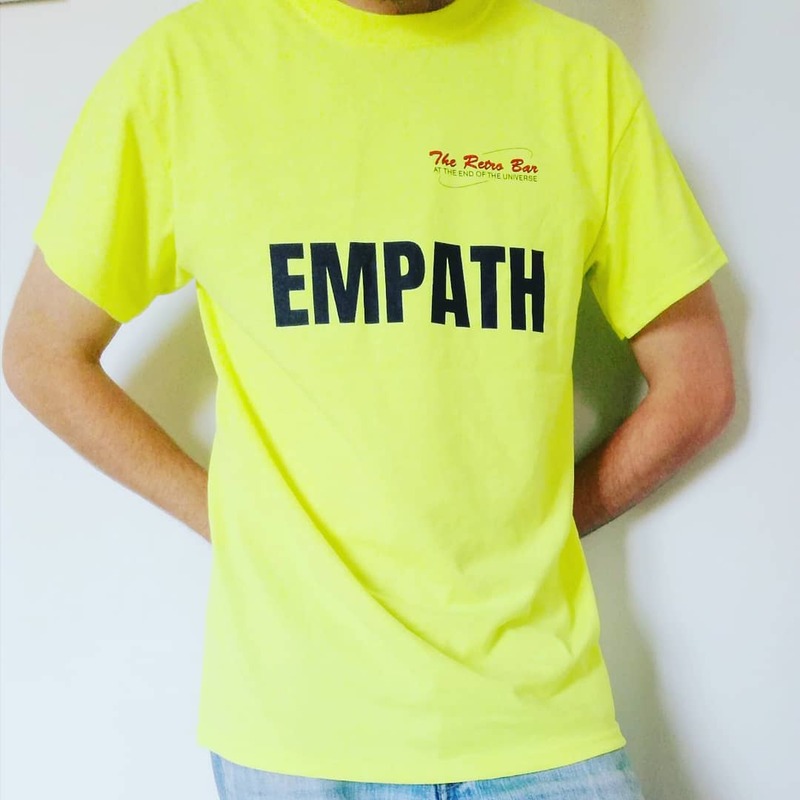 Collective member Ben Parker, with one eye on retraining as a counsellor, suggested that one of the main problems we have with listening and understanding in our culture is due to the centrality of Ego in much conversation as opposed to Empathy. My corresponding thoughts were that Ego in conversation is largely an effect of the scarcity model, which certainly doesn’t just exist as the mediator of trade, but stretches into heart of every aspect of our lives; we don’t compete in either the job market or opinionated debate out of playfulness and sheer joy, we compete because intrinsically we understand that how we fare impacts on our social standing, which in turn impacts on our life standing/life chances. We surmised that what is often so exhausting about customer-facing job roles is that this role places the employer in perpetual empath-mode to face the tapestry of frustrations and nuances of a public free to act out their perpetual states of mild-status panic. Most people don’t naturally gravitate towards positions of ego-dominance, but it seems that certain social conditions make it more important for many more to adopt these social strategies. Social Scientists Kate Pickett and Richard Wilkinson’s extensive research shows that any increase in “inequality [in modern industrialised societies] creates greater social competition and divisions, which in turn foster increased social anxiety and higher stress, and thus greater incidence of mental illness, dissatisfaction and resentment. It seems we have come right back to the notion of the public secret. Ben saw the role of these ‘designated empaths’ as empathic middlemen not for the sake of the reputation of some public institution, but as employers of counselling into the public space, mitigating the moments when our opinions and sense of selves merged to form a social body armour. Although this role wasn’t an idea all of us liked, we saw it as a necessary tactic to employ if we were to earnestly take on the contradictions of the public secret. 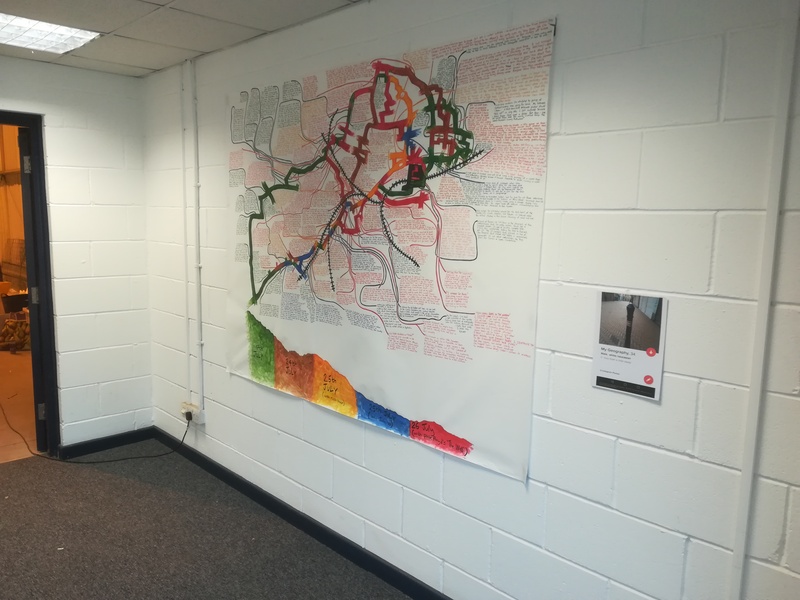 For the foyer of this the large warehouse I created a large map, based on a series of walks taken in and around this area of Leeds in July. 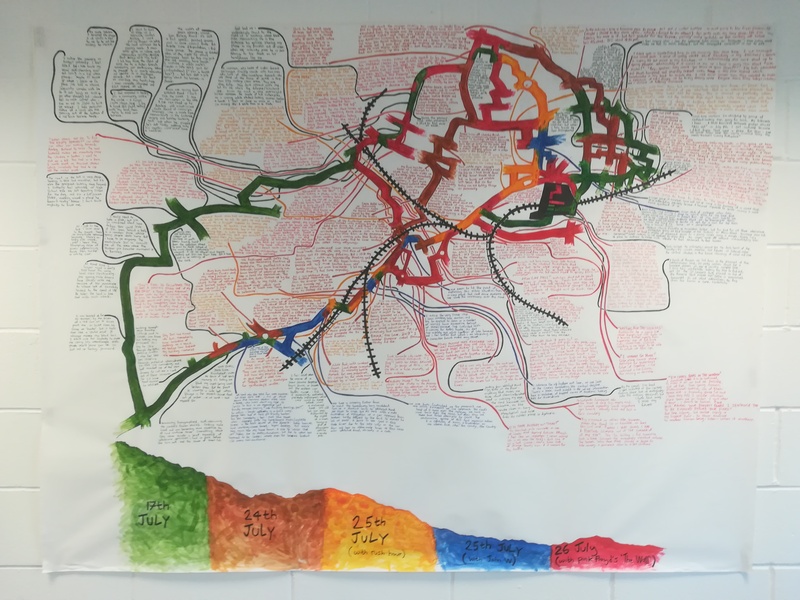 Over the course of this decade I have developed ways of mapping emotional responses to being in towns, cities and their unwelcoming car-orientated hinterlands. However, with this map I tried to cut out the middleman of social and moral filtering, and write exactly what I was feeling, no matter how pathetic or inappropriate it sounded when reading it back. 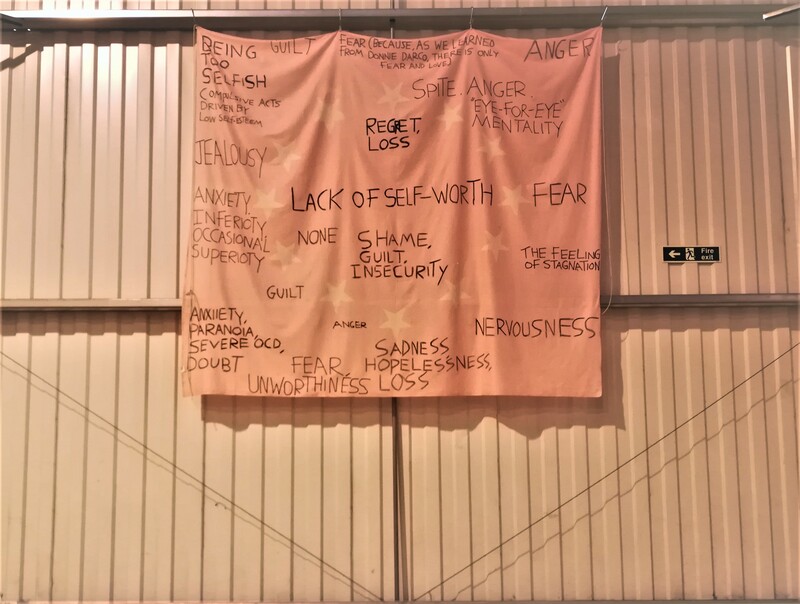 Ben said this emotion map was almost like a strategy map for the larger works in the main space; opening it to a safe space beyond the moral and social filters that construct the generalised public secrets. 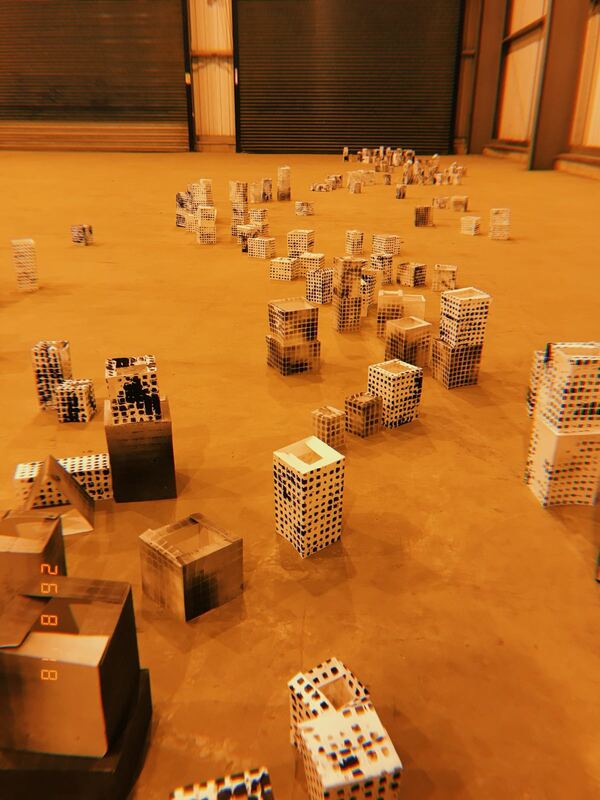 Collective members Sam Read and Rebekah Whitlam took the initiative to build new work for the central space, which was a big challenge judging on the size of the space, and the fact that it would easily swallow what seemed to be ample material supplies. However, what would be produced would be brought into correspondence through a sound installation made by Ben, which would intermittently utter some of the public secrets we had been acquiring through The Public Secret Experiment, an ongoing online project set up by Rebekah asking for our ’21st century confessions’. Ben’s work would sit in between a sporadic growth of small building settlements going around the space. Sam Read describes these settlements as “an assemblage of models made from paper and wire that resemble simple dwellings. Together these units make a town of indeterminate scale. 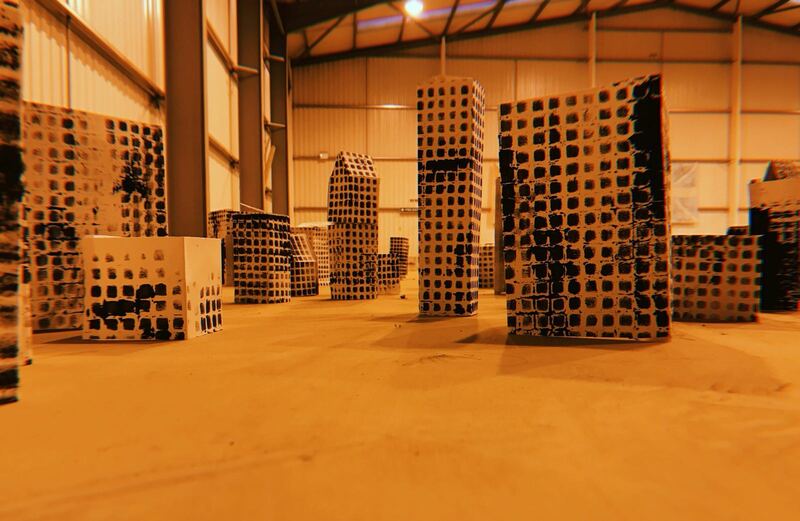 Amongst the architectural models are soft forms reminiscent of turds which occasionally morph into beer mugs, ashtrays and other material culture associated with leisure and respite”. “Whilst Manet’s waitress looks out despondently over the bar and into 19th century middle-class leisure society, this satirical twist explores the links between 21st century city development; ‘sugar-rush’ entertainment; temporary living; commodified self-worth; and an anxiety that scaffolds it all. The work features ephemera from over the past 20 years including FHM magazines from the 00’s and products from a recent closing down sale at Claire’s Accessories. The aim of this work is not to criticise pleasure, but a comment on how our need for pleasure is used to manipulate our inner self, our collective psyche, and our spending habits. There still remained intense discussion about the role of participation within the exhibition, and whether or not we were asking too much of visitors by structuring the show to be wholly participatory. However, we agreed that if was to be about the Public Secret a participatory bent was mandatory. Rebekah invited visitors to make clay and felt models of who they think would work on a zero hour contract in the ‘pleasure palace’. In recent years our pleasure palaces of retail therapy and high culture have been exposed for their poor treatment of the staff who run the places on a day-to-day basis. However, despite this being a common experience, it remains a public secret due to zero hour jobs and minimum wage employment still being largely treat as the moral failings of people who simply aren’t pro-active and aspirational enough. As privately we admit our frailties, anxieties, and wish we could be free from the psychological rat race, our public expressions have never been so status obsessed. With the increase in zero hour work and underemployment so too has there been an increase in status cars, body-perfection obsession and niche/exclusive venues. Like a maddening virus, increases in social status anxiety push us further towards superficial that intensifies the status anxiety cycle. Sam’s settlements largely took on the form of tower blocks. But we had made some more conventional dwelling-shaped templates, which were for the visitors to place where they wanted into the landscape. On the bottom of the templates we ask them to write about which emotions and/or parts of their personalities they tend to hide from society. Whilst on the roofs of the templates we asked them to write about what they have realised about society that they would want to tell others about. 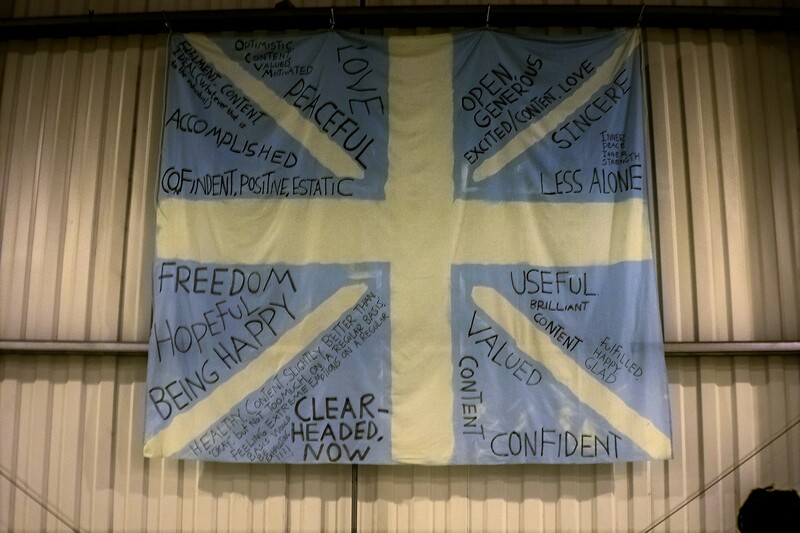 Hanging on the back wall of the exhibition were the ‘results’ from The General Election of Governing Emotions (#GE18). Every voter in #GE18 had 3 votes rather than one choice from 3 competing parties. Vote 1 (pink) allowed people to think about their recurrent emotions, and consequential behavioural patterns, in which they would leave behind, if they had the choice. Vote 2, (green, but looks blue due to poor lighting!!!) asked people how they would potentially like to feel on a day-to-day basis, whilst vote 3 (yellow) asked us how we would like society to feel and behave like on a daily basis. The results of this ‘election’ are displayed on 3 sheets. You can see faint traces of flags of identities that have been party to intensely divisive feelings, especially in recent years. In attempting to bridge any divisions a makeshift bar was mandatory. Due to the fact that we could only physically salvage the bare minimum (largely palettes from the industrial estate) the bar could only merely parody the aforementioned niche/exclusive venues, whose own parodies are clinical and never quite as haphazard as they seem. Our bar, however, so was haphazard it fittingly looked as much like a frontier boundary. Located at the bar, The Public Secret Experiment’s 21st century confessions shared beer mats with more conventional ‘self-help’ memes. There is sometimes a fine line between public secret ‘memes’ and self-help ones, the latter usually pinpointed due to their lazy reliance on the neoliberal vernacular of the self-made ‘hero’. But this fine-line comparison wasn’t a case of point-proving. It was an exercise in trying to see if there is a lie in dominant life-style model of contemporary times, not for sake of being right, but for the sake of wondering how the challenge of the individual finding inner peace and self-worth can be part of a general and collective healing process; because the 2 are so interconnected, the former has been so successfully appropriated by the self-improving entrepreneurial speak of neoliberalism. But this itself opens up a dilemma the collective – as motley in its collective hearts and minds as it is – needs to interrogate. Do projects that try to create safe spaces to understand everybody’s story risk the fate of the person who drinks so much water they are destroyed due to waterlogged blood? Or likewise if we define a stance for ourselves do we run the risk of falling into an echo chamber where we never communicate with anybody we have fundamental disagreements with? They sound like extremes, but in our ultra divided times, where people will rarely encounter those holding vastly different beliefs, it can suddenly become very hard NOT TO become classified a Lefty, and extremist, and Brexiteer, a metropolitan elitist, a hard-line feminist, a misogynist, etc etc. Surely we should refuse to give up on the faint Utopian lining that appears within the fabric current crisis of Mental Health. How do you reverse trauma? How do you reverse misgivings, feuds, and toxic senses of entitlement? There is one certain answer to this: NOT by giving up on our fellow human. 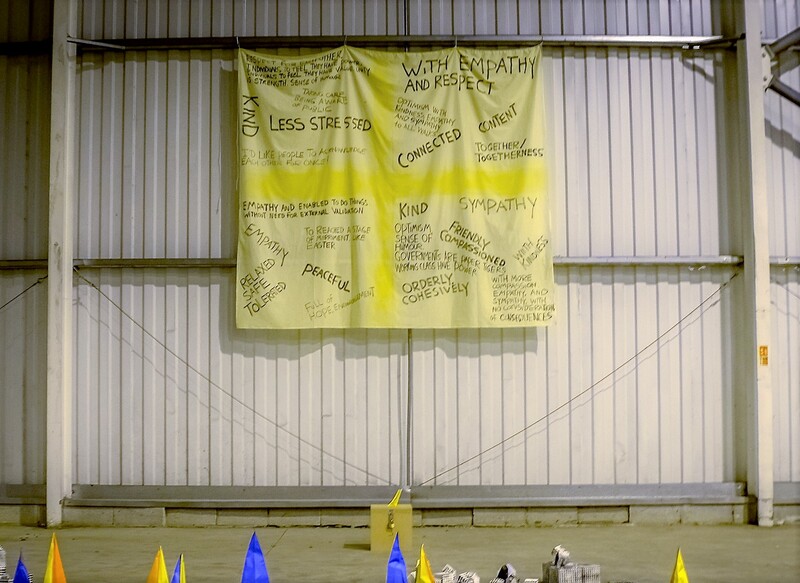 The Public Secret exhibition was installed by collective members John Wright, Benjamin Parker, Rebekah Whitlam and Sam Read, with valuable conceptual input from Liam McCabe, and David Hooppell, who are also involved in the collective. Reblogged this on Punch-Drunk Utopianism. The retrobar is one of the most interesting projects around at the moment. A site for retrospective musing on the human condition within liquid modernity constructed from the debris of a throw away culture it stands for the critical moment which always seems to be deferred by the perpetual pull of the next metacultural fetish. “Stive for more, reach further, always beyond your reach…” the culture industry compels us to always be other than who we are. “But wait,” the retrobar says, “isn’t this the moment of being? Isn’t it from here that we should strive to make our critique?” We can be more than we are, but first we must stop striving to be that which we do not want to be. “Pull up a chair, sit down for five and lets have a think about this.” Really interesting show. Thanks for your supportive words Jonathan. I’m glad you recognise what we are trying to do. Hopefully there will be more of these in the coming year or so…although this one took the best part of a year to figure out! Best of luck with your own Ma outcome, hope you get a good grade for your dissertation!